Photo: One of our native team members prepares water bottles for distribution by boat to those hit hard by the floods. Today we bring you an update from our native team in Myanmar, who have been hard at work these past six weeks, responding to one of the worst flood events in Myanmar’s history. Severe flooding began in July and continued into this month, affecting twelve of the country’s fourteen states, and devastating up to 1,000,000 people. In addition, the government says that at least 100 people have died and 1.2 million acres of rice fields have been destroyed. The flood affected our orphan home as well, but not nearly as bad as if we had not prepared for the rainy season earlier this year. Thanks to your support we flood-proofed our orphan home by bringing in several tons of dirt to raise the entire level of the property along with a new brick perimeter wall to keep area rain-flow from pooling into our space. However, our toilet facilities were damaged by the recent flooding, so we are now seeking to raise money to repair them along with a planned expansion, and to raise the level of the property even higher to help guard against the heavy rains of the monsoon season next year. One of the problems with the monsoon flooding and subsequent pooling of stagnant water at our main campus home is that mosquitoes breed rampantly, in addition to the problem of water snakes, and the risk of cholera and other water-borne diseases. By raising the level of the property even higher, we will be able to further restrain flood waters from entering our property, and significantly reduce the breeding potential of mosquitoes on campus. We are eager to make this improvement to our main campus due to the fact that last month, our field director, and many of the children were sick with malaria and other illnesses due to the heavy rains. However, we are happy to report that they are feeling much better and healthy once again. 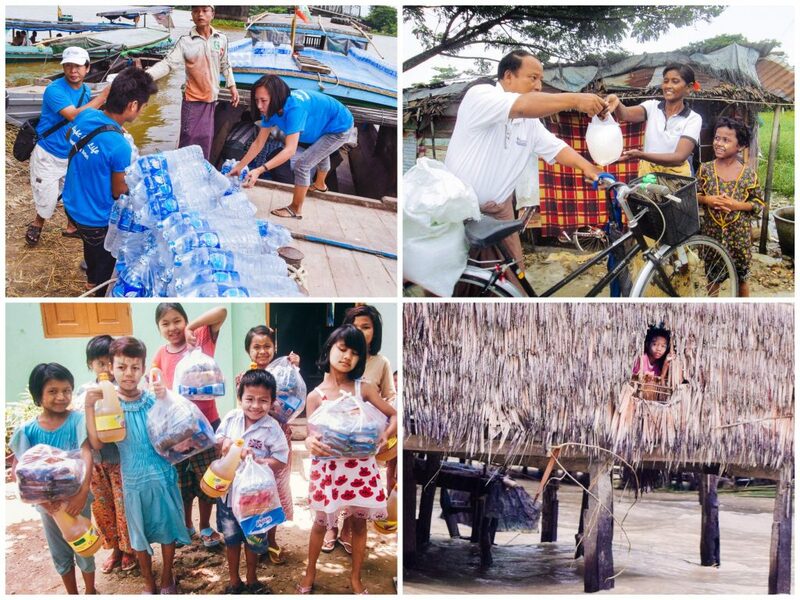 Photo inset: (Top-left): Our native team prepares to distribute water bottles to families affected by the flood. (Top-right): A member of our team gives rice rations to a grateful mother and child. (Bottom-left): Local children affected by the flood are thankful for a plentiful supply of non-perishable food and juice distributed by our native team. (Bottom-right): A child looks out onto the rising flood waters surrounding her home. There is more good news amid this tragedy: Thanks to our rice farm we have plenty of rations safely stockpiled while food supply problems are challenging in the country. Our farmland enterprise produces several tons of rice each year, and along with our piggery project, our native team in Myanmar is able to serve almost 300 meals each day to orphans and staff in four different homes in the country. 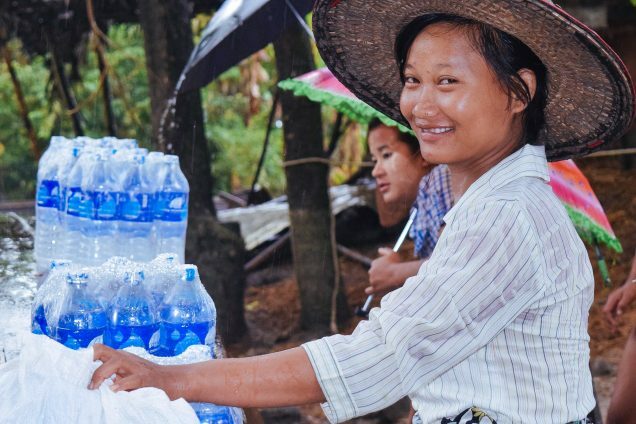 And out of our compassion for the people of Myanmar, our native team has been conducting ongoing relief work by the distribution of water bottles and rice to thousands of people in 5 local villages who were not as fortunate this rainy season. Our native team is also planning to open a preschool in May 2016 and charge tuition to neighborhood families who can afford it. In doing so, we will be able to raise money to fund our programs for our children, and our outreach efforts to the local community. We also hope that the preschool will help us build more harmony with our neighbors in the community. We are seeking to raise $6,520 to build the preschool which we believe will become a reputable foundation of quality education for young children in Myanmar.